I’ve always been afraid of baking bread. 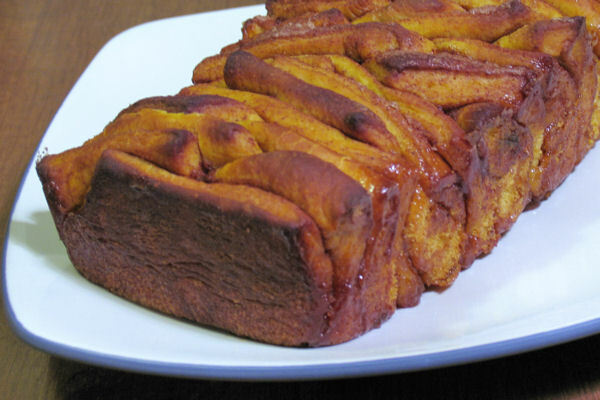 Not quick breads of course, since they’re so easy! But there’s something about yeast… and I don’t know why. I’m slowly working up my nerves. I’ve been making my own pizza dough a little more regularly now, and I have made bread a couple of times, though they haven’t all come out as I hoped. This bread came out wonderfully though! 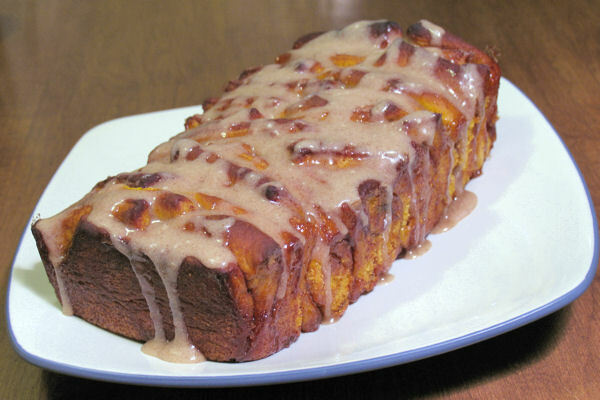 And there are so many great things about this recipe. 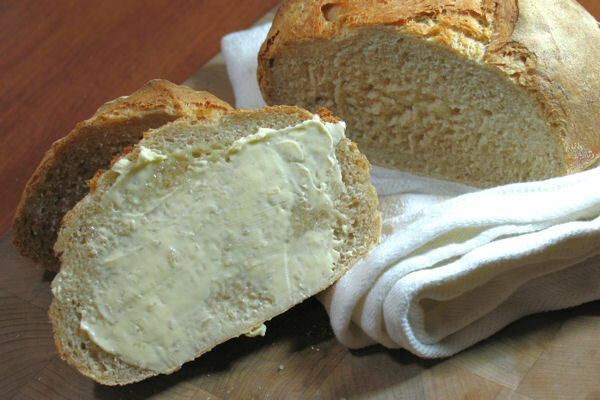 First of all, if you’re at all intimidated by yeast and everything it involves then this recipe is perfect. It involves no kneading, with very short rise times. And this one recipe makes 4 separate loaves, which can be stored in the frig and baked over a 2 week period. Now, whenever I want bread, I can just throw a loaf in the oven and voila I have homemade bread! In a 4 or 5 quart bowl, mix yeast and salt with water. Mix in the flours without kneading, using your hands if need be to get the last bit of flour mixed in. Cover with plastic wrap or a light towel and allow to rest at room temperature until the dough rises and then collapses or flattens on top, about 2 hours. After the initial rise, the dough can be used immediately or covered and refrigerated for up to 14 days. To prepare the dough to bake, dust the surface of the dough with flour and cut the dough into 4 equal sections, each about 1-pound and the size of a grapefruit. Dust with more flour and quickly shape it into a ball by stretching the edges of the dough around to the bottom, rotating the ball as needed. Allow to rest and rise on a cornmeal-covered pizza peel for 40 minutes. As dough rests, preheat the oven to 450 degrees F, and place a baking stone on the middle rack. Remember that it’s ideal to have a hot stone to bake the bread on. 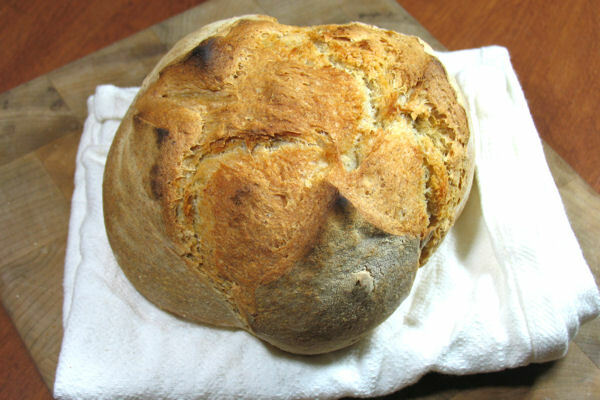 Once the second rise is complete, sprinkle the loaf liberally with flour and slash a cross, scallop, or tic-tac-toe pattern on the top, using a serrated bread knife; leave the flour in place for baking, but tap some of it off before slicing. 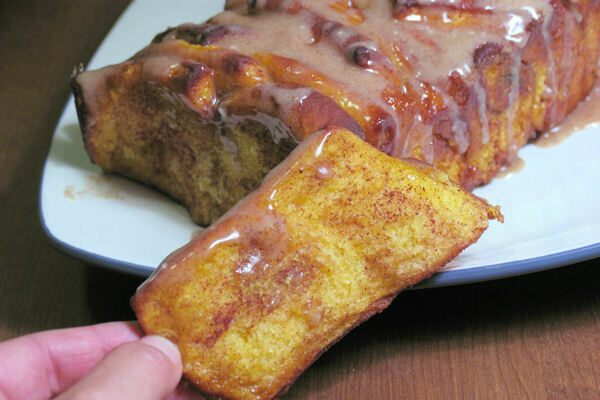 In a cast iron pan or broiler tray, pour 1 cup of hot tap water; place in the preheated oven on a lower rack. Slide the loaf directly onto the hot baking stone. 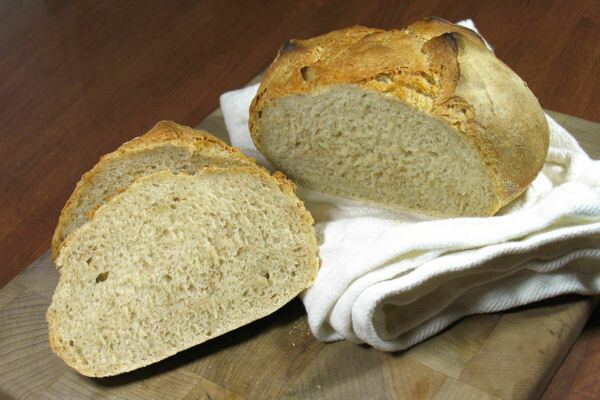 Bake for about 35 minutes or until the top crust is deeply browned and very firm; smaller or larger loaves will require adjustments in baking time. Remove loaf to a cooling rack. Serve while still warm, or let cool completely. This dough is delicious, and very versatile. You can of course use it to make pizza, but it can be used for breadsticks, calzones, pizza rolls, or anything you can imagine with pizza dough! And this dough freezes wonderfully. 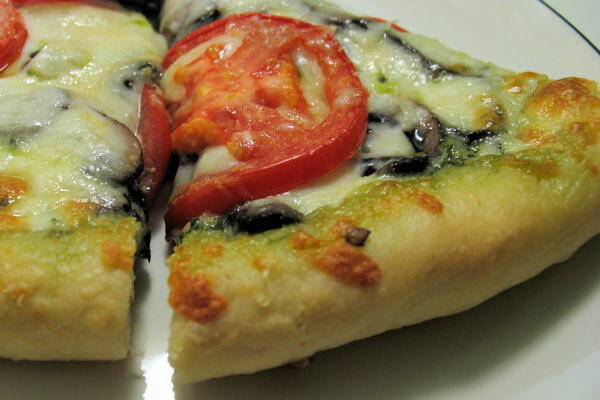 By always having some on hand, you can make pizza any time the craving hits (which for me, is quite often)! Pick and choose your toppings and make a pizza that you really want, without the hassle of going out. Measure the warm water into a small bowl. Sprinkle the yeast over the top; let sit for about 5 minute or until the yeast dissolves and swells. Slowly stir in the olive oil. In the bowl of a stand mixer fitted with the paddle attachment, combine the bread flour, salt, and garlic powder, mixing briefly to blend. With the mixer on low speed, pour in the yeast-water-oil mixture. Slowly add the room temperature water, reserving about ¼ cup of water. Mix until a cohesive dough is formed, adding the reserved water as needed. Switch to the dough hook. Knead on low speed until smooth and elastic, about 5 minutes. Transfer to a lightly oiled bowl, turning once to coat. Cover with plastic wrap and let rise until doubled in size, 1½-2 hours. Press down the dough to deflate it. 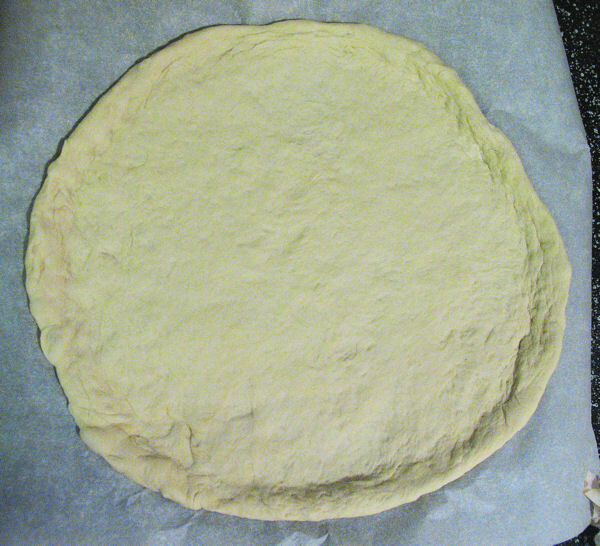 Transfer the dough to a lightly floured work surface and divide the dough into two equal pieces. Form each piece of dough into a smooth, round ball. If freezing, wrap the dough tightly in plastic wrap, then place in a Ziploc bag and freeze immediately. To use the dough, pull it to defrost the night before or that morning. Proceed with the baking instructions. To bake the pizza, preheat the oven 500 degrees F. If using a pizza stone, place it in the oven while it preheats for at least 30 minutes. Before shaping the dough, let it relax at room temperature for at least 10 minutes but no longer than 30 minutes. Lightly sprinkle parchment paper or a pizza peel with cornmeal or semolina flour. For a little garlic flavor, add some granulated garlic to the cornmeal or flour. Transfer the dough to your prepared surface, and shape the dough to your desired size with lightly floured hands. Brush the outer edge lightly with olive oil. Top as desired. Bake until the crust is golden brown, and cheese is bubbling, 8-12 minutes.